Fifteen years ago, while playing in a band together, Ruth and Yigal had a chance meeting with a kaleidoscope artist in London. They fell in love with the artistic process, the discipline and the beautiful kaleidoscopes themselves. They learnt how to make the kaleidoscopes from the artist himself, as well as how to properly care for and maintain the kaleidoscopes in such a way that their beauty never fades. 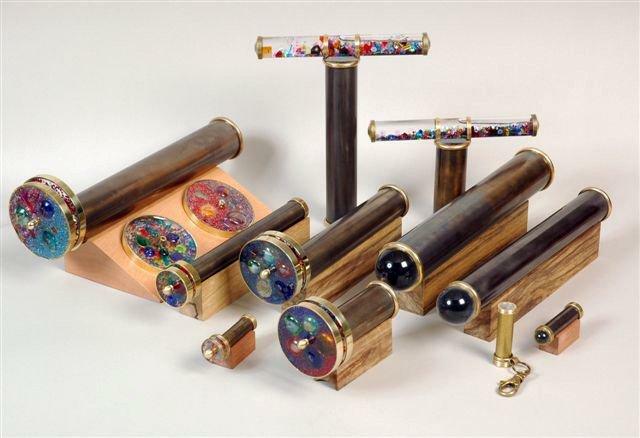 Slowly these kaleidoscopes became a more and more prominent part of their lives. They started out with a small stall in Camden Market, then moved on to Covent Garden, and eventually settled down in Piccadilly Market where they are today. For a few years, they were part of the Steampunk London Collective, which took them and their kaleidoscopes to many fun places, including stalls at summer festivals; Wilderness and Festival Number 6. They are doing other things now as life moves on, but their passion for the kaleidoscopes remains. They never wanted to sell other things, or to 'sell out' and buy cheap produce from abroad to sell instead. This is why they are very happy to now be able to sell their kaleidoscopes online, so that if you can't make it down to the market stalls to hear their stories and meet the people behind them, you can still welcome a little bit of the magic into your home.